I’m back and better than ever! I know every year I say, “this is us it this year is going to be MY year.” But you know what? I never really believed that and last year I never said it. Last year had lows; there is no hiding that fact. With all of the pain, misery and time I spent wallowing, made up when I flipped the switch. I’m not the person who is going to sit in the corner and sulk. Sulking is one of the most unless actions and emotions you can possess as a human. Why waste your time and emotions on something that you have no control over just so others can pity you? Astonishing. It’s completely and utterly pathetic. Someone posted the perfect quote on Instagram and I couldn’t help but laugh at myself, because of the truth that is held with the statement, it’s not a bad life, it’s just a bad day. Exactly! Let me repeat that; it’s not a bad life, it’s just a bad day! Ureka! You’re allowed to have bad days, but you need to move past them. What is the point of feeling sorry for yourself? Everyone gets past that and that’s exactly what I had to do. I took my bad days and turned them around. It took time, but here I am — happier than a bird with a French fry! I still can’t tell if not having expectations for 2015 helped me or hurt me. Of course it’s always better to be surprised than disappointed. Let’s face it, we need to set the bar somewhere. 2015, was awesome. I stood up in one of best friend’s weddings, I traveled a lot, I saw some utterly breathtaking sceneries, I did a lot for me and learned it’s okay to say “no” to plans. 2015 brought me new adventures, incredible opportunities and one of the best surprises. 2015 brought me love, astronomical amounts of love, laughter and pure happiness. There will always be bad days, days when you are sad and feeling low, but that doesn’t mean it has to be like that. Take a moment, reevaluate and move on. If you don’t do something about it, good will never come. Good is what we are searching for. Good won’t just fall into your lap. Good is something you need to strive for. Good is minimum. I’m striving for excellent, fantastic and amazing–it’s what I deserve and it’s what I’ll get. As I finish to write this, (in March and started in January) I can see that I am beyond lucky. I’m blessed. It’s so cliché to say now, but it’s true. Sometimes you need to go to the edge of the earth to get a new perspective and that’s what 2015 did to me. This year, three months in and nothing has been more awesome. 2016 is going to rule. Finally, Jess and Jackie made it safe to DC. After many interactions with the airlines they arrived safely. Every time Jess comes to DC something happens with her flight, it’s either delayed due to weather or trying to locate the aircraft or sometimes a mechanical issue but without skipping a beat Jess always makes it. Yesterday, was no different–she received a call 5 hours before take off saying her first flight was delayed, which then would make her late for her connection. After spending 45 minutes on the phone with the airline everything was taken care of. I want to give you a few tips and ticks in the case of your flight being delayed (or cancelled). After hearing the news you might have some extra time at the airport. Of course, there many totally unpredictable circumstances that are totally out of your control. But there are some things that you can do to help the situation. 1. Be early- Just be early. It’s better to be early than late especially when flying is involved. 2. Know your rights- It could be a massive storm or maybe your flight is overbooked and you’ve been left at the airport. In cases such as these, it is vital that you know your rights. Armed with this knowledge, you should be able to claim what you deserve and hopefully find a solution to your problem with a few aces up your sleeve: from getting refunded for all your food and drinks expenses to getting a hotel or some alternative transportation. 3. Always buy the insurance- This one is a no-brainer, but it’s also something you don’t think you’ll need until you do. Travel insurance is a guarantee that whatever trouble you might encounter it will be easier to solve. This ‘extra’ cost will prove a worthwhile investment if the unexpected happens. However, it’s a common holidaymaker mistake to not get insurance that covers every possible need or problem you might have. 5. Get on the phone immediately– If the flight has already taken off without you or you know you won’t make it to the gate on time, get on the phone with the airline immediately. They should reschedule you on the next flight at no cost if the connection time was unreasonably brief. Ask for compensation, such as a flight voucher, if you feel you’ve missed your connecting flight through no fault of your own. 6. Explore the airport- Entertain yourself- This one is my favorite because more than likely you have something with you to kill time, book (or an e-book reader, with lots of titles in its memory), your laptop or a tablet loaded with films the options are endless. When in doubt you can always create a music video like this guy did. As we’ve learned from many situations short airport connections can be a blessing, but only if you actually make your flight. Remember when it comes to tight connections, every second counts. Knowing your rights really help you to rebook your flight. Good luck and happy flying. After moving to DC, I expected to get a million visitors. I like guests! I like getting to be a tourist in my own city and of course I like hosting friends. This past January, Matt made the move to DC, too and since, our apartment has been a revolving door that never seems to stop. I complied a list to help you get through every last guest who’s on vacation. After many visitors Matt and I have gotten used to having our apartment be a breeding ground for travelers. Check out my handy guide to staying sane while hosting because no one wants a cranky host. Some of these items might sounds a little COD, but to ensure that both you and your guests have fun I would stick by these guidelines. Remember, they are coming to visit you but also to explore the city you don’t need to feel obligated to do everything with them. Be sure to show your visitors your favorite places that are both on and off the tourism paths. Not only do I love Fourth of July but I love having visitors. I am so excited about this weekend because both of those things will be mixed together. Two years ago I was introduced to Emily, who was interning in DC, and we hit it off. Ever since that summer our friendship has thrived. Emily has spend a 4th in DC before but now she is bringing her boyfriend Rob along for a wild ride. Read below to hear Emily’s thoughts and expectations for this holiday weekend. You can find Emily on LinkedIn & check out her blog she had running while she was in DC. As an avid follower of “omg it’s kendalann”, I was very excited when Kendal asked me to write a post about my upcoming weekend in DC. Two summers ago, I had the incredible opportunity to spend two months living and working in our nation’s capital. I met so many great people in DC that summer and I am fortunate that my friendship with Kendal has continued despite our geographical separation (I currently live about 6 hours northeast of DC, in Albany, NY). This will be my second time getting back to DC since my summer there. While it is going to be a very quick trip, I am so looking forward to everything we have planned! To kick off our celebrations for the day, a group of us are going to watch the Washington Nationals take on the Chicago Cubs! I can’t think of many things more American than going to a baseball game on the 4th of July. To continue the celebrations after the game, I am hopeful we can find some frozen red, white and blue margaritas to cool down a little. If there is one thing I remember from my summer in DC, it is how hot and humid it can get in the city! Hopefully, if all goes as planned, the only thing we’ll have to worry about during the day is where we want to watch the fireworks from in the evening. Even though the fireworks won’t start until dark, it is very important to claim a spot early because of the large crowds of people around for the day’s festivities. Two years ago, I watched the fireworks from the steps of the Lincoln Memorial. I’m excited to see where we watch them from this year! The only other thing I really want to do while in DC is go out for brunch on Saturday morning! Until I lived in DC, I had no idea how much fun brunch can be. Many restaurants in the capital offer specials for their weekend brunches. I would recommend checking out reviews and trying a number of different places before settling on a favorite spot. This weekend, we are going to try a new place for brunch, a local restaurant called Medium Rare. I’m excited! Let’s talk ball. This past weekend, the opportunity to go to Cooperstown was in our hands and we gladly jumped on that train. Thanks to our friend, Patrick (HSO!) the three of us set out on the journey to Upstate New York last weekend. And as you guessed it, our first stop was Cooperstown. Sure, I love baseball but there is no comparison when it comes to how much Matt loves baseball. Take a peek at the guest blog below from Matt. Matt recaps his visit to the holy land: Baseball Hall of Fame in Cooperstown. If you haven’t been and even if you have, he writes it in a fashion that you are enjoying his pilgrimage alongside of us that weekend. As a diehard baseball fan, I had never made the pilgrimage to Cooperstown, New York to visit the National Baseball Hall of Fame and Museum. I’d actually never even been to New York before. How sacrilegious is that? With so much history, tradition and baseball in one place, how had a fan, like myself, never set foot on such sacred grounds? Well, that all changed the second weekend in June as Kendal Ann, Patrick and I had planned to go up to Upstate New York for a long weekend and made a pit stop in Cooperstown to check out the Baseball Hall of Fame. Let’s just say that I was mesmerized by how much baseball tradition is enshrined within the walls of the Baseball Hall of Fame. After parking the car and wandering down Main Street, taking in all the sights, sounds and smells of baseball heaven, we finally made it to the coveted Baseball Hall of Fame. The Baseball Hall of Fame is celebrating its 75th Anniversary this year and we picked a great weekend to visit. Not only was the ‘Iron Man’ Cal Ripken, Jr. there himself (we unfortunately did not see Cal) for various events throughout the weekend, the Baseball Hall of Fame actually was opening a brand new Babe Ruth exhibit on the day we went. Talk about great timing. Once inside, we picked up a map and started to decipher where to go and what to see first. After opting to start on the third floor and work our way down, we entered the “Sacred Ground” exhibit. This exhibit featured quite a bit of information about the ballparks, past and present, themselves. It also featured a ton of new and old memorabilia, such as the Rally Monkey, which is a plush monkey that made appearances in late-inning situations for the 2002 Anaheim Angels’ World Series-winning team. The exhibit changes from ballparks to players, highlighting individual records that each player has accomplished. Records such as Ripen, Jr.’s consecutive games played streak and the most games played in a career (Pete Rose; 3,562) are records that may (will) never be broken. Finally, upon exiting this exhibit, they have replicas of each ring that the World Series champion receives. It was interesting seeing how gaudy the rings have gotten over the years; it really is all about the bling. After seeing some great exhibits on the second floor, we headed back to the first floor and walked into a shrine filled with the greatest people to ever be a part of the game of baseball. The bronze busts of each National Baseball Hall of Fame member fill the oak walls from top to bottom. There are 306 total people lining these walls, enshrined in this temple of baseball holiness forever. It was a beautiful sight to witness, one that I never will forget. On the back wall, the original class of Christy Mathewson, Babe Ruth, Ty Cobb, Honus Wagner and Walter Johnson, is singled out and makes known the start of the National Baseball Hall of Fame. Finally, the other neat exhibit on the first floor is a small one and somewhat hidden. It features all kinds of memorabilia from baseball films. Being the movie buff that I am, especially with a soft spot for baseball-related movies, I got a kick out of this exhibit. There’s even a list that gives all the names of the baseball movies, which was quite informational – I mean, did you know there are three Sandlot movies? I knew of two, but not the third. There was even a great black and white photo of my brilliant Twitter avatar, (if you don’t follow me, you probably should @hamsterjockey) Rick ‘Wild Thing’ Vaughn, made famous in the Major League films. Overall, my first trip to Cooperstown and the National Baseball Hall of Fame and Museum was a definite success. It was so much history packed into one visit though, but that just means I will have to go back. I highly recommend that if you have not been there, visit as soon as you can. If you have visited there, I highly suggest that you go back. What you are going to read is going to change the course of your life. Now, I don’t know how or why Matt and I started to watch River Monsters, rather why he introduced me to this show, but I couldn’t be more happy. River Monsters is a documentary television series that airs on Animal Planet, hosted by Jeremy Wade. HEres a little information on the show, and yes it is the Wikipedia version they just have the information down pat. River Monsters travels worldwide with Suffolk, England born host, biologist and extreme angler Jeremy Wade to explore freshwater mysteries and local folklore, possibly debunk these myths and track down these harrowing tales. The show has taken viewers to Germany, Spain, Italy, Scotland, Iceland, Norway, Argentina, Australia, New Zealand, Papua New Guinea, India, Japan, Russia,Suriname, Brazil, Ethiopia, Uganda, South Africa, the Republic of Congo, Mongolia, Guyana, and the American states of Alaska, Florida, Missouri, Oklahoma, Texas and Vermont. The beauty of this show is you don’t need to know anything going into it because Jeremy will teach you everything you need to know about the area, the fish and the myths behind the Monsters he is catching. Thanks to Netflix you can sit back, relax and become engrossed in four exhilarating seasons of River Monsters. If you don’t believe me that this show is worth watching just take a look at these stats. Be warned, once you start watching you will be hooked (all puns intended). 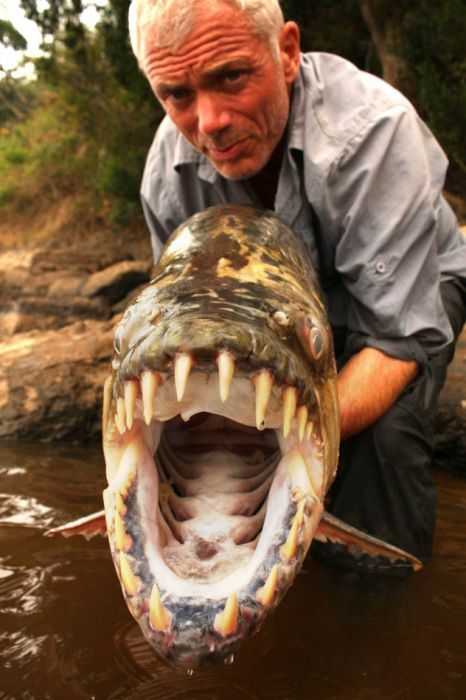 River Monsters had the best series premiere in Animal Planet’s network history by delivering 1.3 million viewers. It was also its most watched regularly airing primetime telecast in over six years. The second episode of Animal Planet’s River Monsters delivered a 39% boost in total viewers (1.866 million) compared to the series premiere. Those numbers made it the best performing regularly scheduled primetime telecast in Animal Planet’s history. The first season of River Monsters made it the best performing show in Animal Planet’s history with every episode averaging over 1 million households. The season finale delivered about 1.47 million households. Remember back in February when I was talking about the new goodies called croknots, cronuts, crodolis and so on? Well I am ready for a new treat, the beignet, which I am sure you’ve heard of. This treat is a New Orleans classic. Now, I’ve never had one, but I can only picture what it tastes like. To me, a beignet is a cross between a funnel cake and a donut. Beignets were also brought to Louisiana by the Acadians. These are fried fritters which are often a treat. Sometimes they may be savory dishes as well and may contain meat, vegetables, or fruits. From what I understand, the beignet is a square piece of dough, fried and covered with powdered sugar. Later tonight I will be making a pit stop at the ever-famous, Café du Monde, and I am sure it is going to be a highlight of this New Orleans trip! Café du Monde is a popular New Orleans food destination that specializes in the powdered sugar beignets. I am beyond ready to experience some New Orleans tradition! It’s that time again. Matt and I always seem to have visitors and house guests. Since April, our house has been a turn style of people. This week, we are back in the saddle once again and we find ourselves playing dress up. I like playing dress up especially when it’s to be a tour guide. When most people visit DC their time is often spent on the National Mall, but there’s much more to the city than that. As a resident of the area, I can tell you there are lots of other interesting places to explore than the Mall. So here are some suggestions of interesting places besides the National Mall to take your out-of-town visitors. 1. Waterfront- If you are heading down to Nationals Park or going to Bluejacket, the Waterfront is an awesome area to take your guests. While you are down there you might as well take them to the Titanic Memorial. 2. Roosevelt Island– This is a hidden gem in the city. Often, I don’t take people here, but when I do they are always thankful. 3. The Roofdeck of the Kennedy Center– This one is prime. Now that the Old Post Office Pavilion is closed and the Washington Monument isn’t open (yet) this is one of the best view’s in the city next to the P.O.V Lounge. 4. A Capitol tour– Sure, I am a nerd and yes, this is my favorite place but I think everyone needs to go here at least once. 5. Old Town Alexandria– Woah, calm down I know this isn’t “in the District” but it’s a great place and really screams East Coast mixed with Southern hospitality. King Street is a major road in Alexandria and it will lead you to explore the historic Old Town Alexandria. 6. Eastern Market– It doesn’t matter if you like art, food, or music there is something for everyone at Eastern Market. Go out and explore. Next time you have guests in town, I hope you take them “off the beaten path” and do some local things rather than making their stay totally tourist. Like you’ve always learned in school, you learn something better when you teach it yourself. Personally, I think that is true for anything. Last week, we had two house guests. I proposed the idea to Matt that he play tour guide to get a better feel of the city. Since Matt has been visiting and moved to DC his grasp on the city is great, but you always learn better when you teach someone else. Last week, two friends came to visit me in DC from the great state of Minnesota. Each of them had previously been to DC, but not for a few years. There was obviously much to see to refresh their memories in terms of sightseeing and much for us to catch up on as well. In my guest blog post last week, I talked about how it was going to be fun for me to play tour guide instead of tourist. As I said, I was a little nervous and leery about it, but once my friends got here and we started walking around, I really hit my stride as tour guide and got into the groove of things. During the time that they were here (a week), we visited the United States Capitol, the White House, the Washington Monument, the Lincoln and Jefferson Memorials, saw the Cherry Blossoms, took them to various local spots around DC, woke up early to watch the sun rise with Abe and even made dinner with them one night as well. We walked A LOT. Anywhere from 7-10 miles a day, but that’s one thing that I like about DC. They fit a lot of sightseeing into only a week in DC. They did even more without me there, but in the end, I really feel like they got a great taste of DC from my point of view. I got to show them the places that I really enjoy and make a habit of going to around town. Another great thing about them visiting was that it let me still be a tourist in terms of trying new places, such as Bull Feathers. This city is bigger than any other city that I’ve lived in before, so I am always hearing about and trying new places. Overall, I loved playing tour guide and I’m really excited to do it again. Who wants to visit next? Any takers? When you have someone come visit, what are some of the hot spots that you make sure to take them? Being a tourist in your own city is never fun unless you have a really good excuse. I used to have a great excuse, Matt, but then he moved here and became a local. This week Matt and I have visitors coming for a week, and this is the perfect opportunity to show them all the tourist places while getting the local flavor. I asked Matt to write a blog about being on the “other side” of the tourism trap in DC. It’s one thing having someone guide you around this city, but it’s another to play the role of tour guide. Tonight, and for the next week, two of my friends from Minnesota will be visiting and staying with Kendal Ann and I. I’m pretty excited. Yes, I’ve made some great new friends in my short time living in DC thus far, but it’s always great to see friends from back home who you haven’t seen in a while. I’m really looking forward to spending some quality with friends and exploring this great city even more. One of the odd things for me will be taking the role of tour guide instead of being a tourist when my friends are here. As I said earlier, I’ve only been living in DC for a short time, but before that, when Kendal Ann and I were doing the long distance thing, I visited quite frequently. Those frequent visits took me to lots of new places that I had never heard of or had been to before. It was great – so many new firsts and I still have new firsts every week! But seeing all these new places and learning more about this city has given me my own view of places I think are interesting, places I’ve seen but have never been to before and places that I won’t ever go back to. I think that happens to everyone though once they start living somewhere new because you really start to try new things and new places, all while figuring out what you like and what you don’t like. I think that I have a pretty decent grasp on where to go and how to get around in the city. However, I still accidentally walk past the White House and when it finally registers with me I’m like, “Oh hey, Obama” in my head. One interesting thing though that won’t be problematic per say, is the fact that I stick to routes that I trust and routes that I know when getting from Point A to Point B. Like I said, not a bad thing, but it’s something that I should try to work on while being the tour guide, just so my friends get a variety of different views throughout the city. Overall, I’m looking forward to giving my friends a view of DC through my eyes, focusing on the sights and sounds that I think are important parts of the current city that I live in. It’s going to be a great week with big things on the horizon. I’ll give you an update of how it went next week! If you’re interested in the things that I’ll be doing and the places that I will be taking my friends, I’ll just leave a link to my Twitter and the hashtag #MinnesotansTakeOnDC.